Make in India Week has definitely benefitted a lot of brides out there who are looking for something fresh and ethnic in bridal couture. 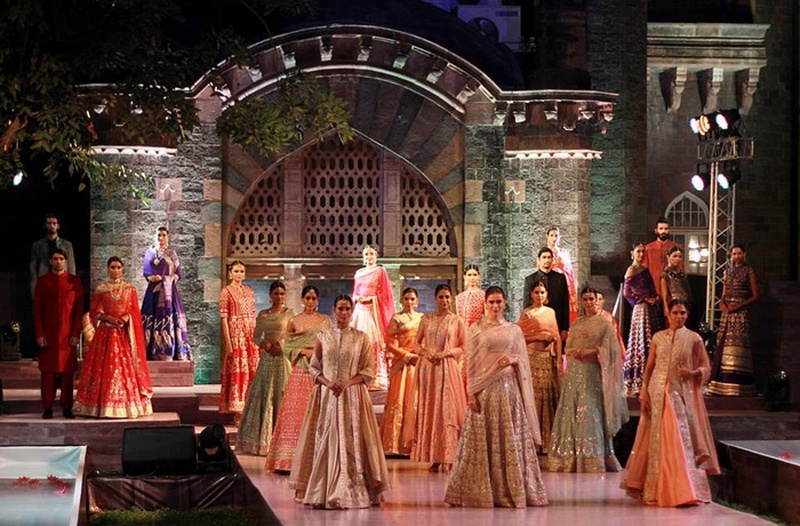 Soon after the “Weaves of Baneras”, what caught most eyeballs was the Maharashtra Textile Show held at the iconic Prince of Wales Museum to commemorate Maharashtra Textile Day. The show witnessed ace fashion designers like Anita Dongre, Neeta Lulla, Anju Modi, Shaina NC and every bride-to-be’s favourite Vikram Phadnis put up a splendid show. While Neeta Lulla displayed Paithani weaves with modern yet ethnic silhouettes, Anju Modi gave us an impactful collection featuring a vast range of colours and hand-made embroidery. And, while Sonali Bendre walked the ramp for Shaina NC looking like a “chan Marathi mulgi”, staging regal was Soha Ali Khan in a breathtaking lehenga-choli creation by Vikram Phadnis. Don’t miss noticing the jewelry the models are wearing, they’re exceptionally dazzling. Look!